Lubricants are primarily used to reduce friction between moving surfaces and for better performance of machines. Lubricants can be mainly divided into three product segments including mineral, synthetic and bio-based lubricants. Bio-based lubricants are renewable and biodegradable in nature and are manufactured from either vegetable (palm oil, castor oil, sunflower) or animal derived oils. Being more eco-friendly, bio-based lubricants are expected to grow at a higher rate than mineral oils and are expected to gain market share over the next six years. Owing to their unique chemical, mechanical, and eco-friendly properties, bio-based lubricants are finding applications across a host of industries including automotive, agriculture, shipping, forestry, and railways. Increasing automobile demand is fueling the demand for lubricants. Regulatory sanctions on mineral lubricants owing to their environmental impact are encouraging the utilization for bio-based lubricants. Governments are promoting development and use of bio lubricants to lower the emission of greenhouse gases and energy consumption as per regulations. There are several regulations and policies that exist in favor of bio-lubricants in European and North American countries. However, volatility in mineral oil prices and high cost of bio-based and synthetic lubricants are posing a challenge to the market. Turbine oil, compressor oil, gear oil, hydraulic oil, bearing oil, heat transfer fluid, nanomaterials based lubrication and re-refined base oils and lubricants are the major contributors to the lubricants market. Turbine oil is a high quality mineral oil with excellent water separating qualities. It is used in power plant steam and gas turbine lubrication due to their high corrosion and oxidation inhibiting properties and foam suppressing properties. Hydraulic oil lubricant is used in industrial machinery, construction equipment, automotive, aircraft, and marine applications. It is also used in heavy earth moving equipment such as excavators and forklifts. Asia Pacific is the leading market for lubricants, owing to strong demand emerging from growing economies of China and India. Asia Pacific accounted for approximately 40.2% of the total lubricants demand in 2011. The demand for lubricants in Asia Pacific region is mainly contributed by the growth of the automobiles market and the rapid industrialization taking place in the region. Asia-Pacific dominates the production of vegetable oils which are used as an essential raw material for bio-based lubricants, but when it comes to consumption, Asia Pacific is far behind North America and Europe. North America is the second biggest automobiles market after China. The economic conditions prevailing in the U.S. is taking a toll on the U.S. automobiles market which is slowing down the growth of consumer automotive lubricants market in the region. Volatile base stock prices are a key factor behind the growth of revenues in the North American lubricant market. Europe is also considered to be a mature market nearing its saturation point which is one of the reasons behind its slow growth. Moreover, the Euro zone debt crisis prevailing in the region (mainly in Western Europe) is hampering the growth of various industries across the region. The market for lubricants is mainly driven by demand emerging from growing economies of Russia and other CIS countries (Ukraine and other countries), due to rapid industrialization taking place in this region. Royal Dutch Shell, Exxon Mobile, British Petroleum, Chevron, Castrol, and Total are among the leaders in the bio-based lubricant market. Royal Dutch Shell dominated the bio-based lubricant market with 20% share of the overall demand in 2011, followed by Exxon Mobile and British Petroleum together, accounting for over 32% of the bio-based lubricant market in 2011. 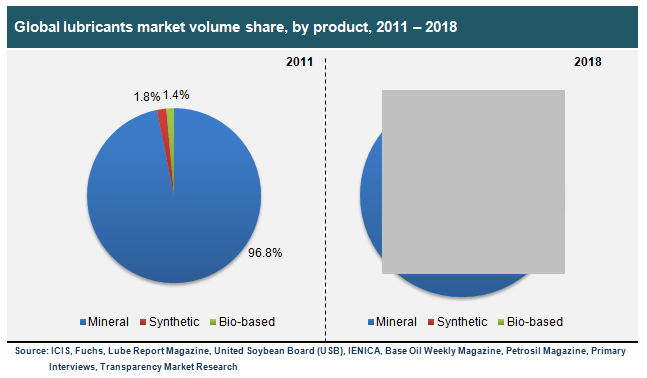 Similar to the bio-based lubricant market, the global mineral and synthetic lubricant market is also dominated by a few companies. Royal Dutch Shell holds the maximum market share of 13.5%, followed by Exxon Mobile and British Petroleum together, accounting for over 20% of the mineral and synthetic lubricant market in 2011. Castrol, Chevron, Total and Fuchs are other major mineral and synthetic lubricant companies. The remaining lubricant market is shared by a large number of medium and small companies. The expanding automotive industry has triggered robust technology trends in the lubricants market. Lubricants ensure smoother mechanical performance by reducing friction between moving surfaces. There are three main types of lubricants available in the market. These are: mineral, synthetic, and biobased lubricants. Of these, synthetic and biobased lubricants are expected to demonstrate a steady growth in demand worldwide. The report studies the present market prospects, growth trajectory, and technology trends in the lubricants market. It cites the major growth drivers propelling the market and identifies the potential restraints that are likely to impede the global lubricants market. While applications of lubricants are abundant, the market is predominantly impelled by the substantial demand for compressor oil, turbine oil, hydraulic oil, gear oil, heat transfer fluid, bearing oil, refined based oil, and nanomaterial-based lubrication. The report constitutes an analytical overview of the market. Historical data is used to study the growth trajectory exhibited by the market and investigate the potential impact of prevailing market forces. To study and measure market competitiveness, leading players have been profiled in the report. Data obtained from their financial reports has been evaluated in this regard. Using analytical tools such as SWOT analysis and Porter’s five forces analysis, the report identifies the strength, weaknesses, threats, and opportunities of the major players and factions in the market. The global lubricants market is expected to reach a capacity of 44,165.11 kilo tons in 2020, exhibiting a steady 1.72% CAGR. The market stood at 39,140.12 kilo tons in 2013 in terms of volume. Accelerating demand for automobiles is the key factor driving the lubricants market. Regulatory sanctions imposed on mineral lubricants owing to their adverse environmental impact are bolstering the market for biobased lubricants. Regulations imposed in Europe and North American countries to curb the emission of greenhouse gases is also likely to boost the biobased lubricants market. The aforementioned factors augur positive growth and acceptance of lubricant products. However, vulnerability to crude oil prices and high cost of synthetic and biobased lubricants will pose a threat to the market. Nevertheless, the key players are expected to capitalize on the new technology trends in the lubricants market. Increased R&D investment to develop innovative products is also likely to create opportunities in the lubricants market. Geographically, Asia Pacific leads the global lubricants market owing to increasing demand from emerging economies such as India and China. Rapid industrialization, followed by expansion of the automobiles market, registered in the region has helped the lubricants market to prosper in Asia Pacific. North America is the second largest regional lubricants market. Meanwhile, Europe has registered sluggish growth prospects in terms of demand for lubricants, since the lubricants market in this region has already reached saturation. Exxon Mobile, Royal Dutch Shell, Castrol, Total, British Petroleum, and Chevron are among the leading players in the biobased lubricants market. Royal Dutch Shell led the biobased lubricants market, accounting for 20% of the total demand registered in 2011. It was trailed by Exxon Mobile and British Petroleum, which collectively held 32% of the biobased lubricants market in 2011. The scenario didn’t alter much in the case of the mineral and synthetic lubricants market, which was also led by Royal Dutch Shell with a 13.5% market share. It was followed by British Petroleum and Exxon Mobile, collectively accounting for 20% of the mineral and synthetic lubricant market.